Gary Walts is an award winning photographer who has been photographing weddings in Northern & Central NY for over 25 years. Click here to see more wedding photos. 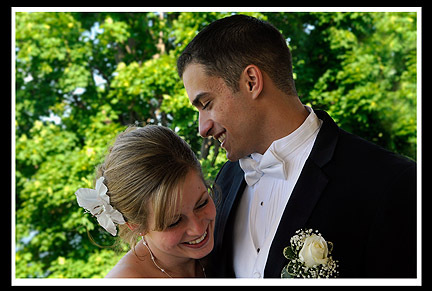 If you are looking for an experienced, reliable wedding photographer in Northern or Central New York, look no further. You found ME!, Gary Walts. I have been photographing weddings for over twenty five years. You may rest assured that I will photograph your wedding in a professional manner, create photos that truly stand out from the rest, and at an affordable price. My basic fee is $750.00 for which I shoot the wedding , starting at the brides home or wherever she is getting ready, through the reception. 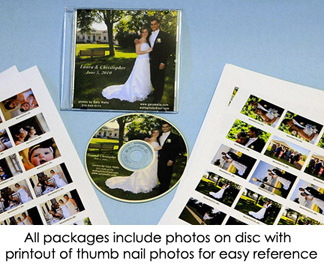 Photos are delivered on CD / DVD, hi-res digital files, with a printout of all the thumbnails. You own the photos, therefor you can take them anywhere you like to have prints made. Upload them to any number of web sites such as shutterfly.com or kodak.com (there are many more) to have prints, books, albums made at your leisure or as it fits your budget. This tends to be the most affordable approach for those looking to get top notch photography at a reasonable price. I realize that the above is not for everyone. Some people do not want to be bothered with, or have the patience to "do it themselves." So, I will work up a price for whatever you might be interested in. Your package can be anything you want it to be. My basic fee of $750.00 still applies, and you still get the disc full of photos with the thumb nail printouts. It's simply that anything else you like gets added to that price. 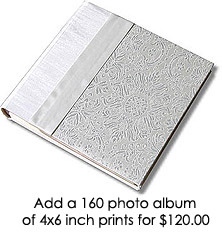 Suppose you would like a 4x6 album of 200 photos. No problem. I just work up the price and get it done for you. Suppose you see a package from another photographer that you like, present it to me and I will do the same thing, for a similar price (but NOT LESS than my base fee of $750.00) The key difference is that I really make excellent photographs. I know what I am doing and have the experience how to grab those special moments and react to the unexpected. This is another great option for those that do not want to do any of the work. I will do it for you. The basic $750.00 fee applies. You just use me for all the add ons that you would like after the wedding. (For an additional cost, of course). You don't pay for the extras up front. That way you get what you want, when you want it. In other words, after you have had your photos for a while you may have decided that there are a dozen you want blown up to 8x10s. Maybe a couple of 16x20s. Maybe an 8x8 photo book. You simply e-mail me the file numbers from your reference sheets, tell me what you want (size & quantity)include payment and I will quickly get the prints and/or books made and shipped to you. This option is for those who would like to create their own books, upload their own images, order their own prints, but do not know how to do it. You simply hire me to come to your home, or other meeting place (public library?) and I arrive with my laptop, wireless internet connection, and show you how it's done. (This option requires that we live reasonably close to each other). I become your private tutor for an hour or two (maybe 3). What you learn will be rewarding and fun. Then in the future when you want to make a photo book of your kids from all of your family snap shots you will be equipped to do so. Your kids grandparents will love it! We require a deposit to secure your wedding date. The minimum deposit is $250.00 but can be more if you wish. We would like a second payment of $250.00 on the wedding day, and the final $250.00 payable upon delivery of the photos. However, you can make other arrangements for payment, just ask. Photography fee includes up to eight hours of coverage and all expenses. The photographer will start at the bride's home or where ever she is getting ready for the day. From there he photographs the wedding ceremony and reception. Walts is particularly good at capturing spontaneous moments through out the day. He will also take all of the group shots. These are usually taken during the time between the ceremony and reception. Sometimes they are done at the reception. Basically, Walts will shoot whatever you request. You take possession of all the photos. They are yours to do with as you like. Digital photos on a CD or DVD can be taken to Wal-Mart or any number of other places for printing. Because they are yours, this can be done at your liesure as your time & budget allow. The fee includes post production of the photos. Theoretically we could deliver your photos on your wedding day, however, digital photography is not perfect. Sometimes certain photos need to be adjusted for detail, brightness, etc. so that they print & display well. We edit & adjust the photos as needed. We burn them to CDs or DVDs presented with a professional touch. Click this photo for more. Click on any of the small photographs to view larger versions. Click your browser back button to return to main photo page. Thanks for the visit. Please return for updated & improved portfolio section.